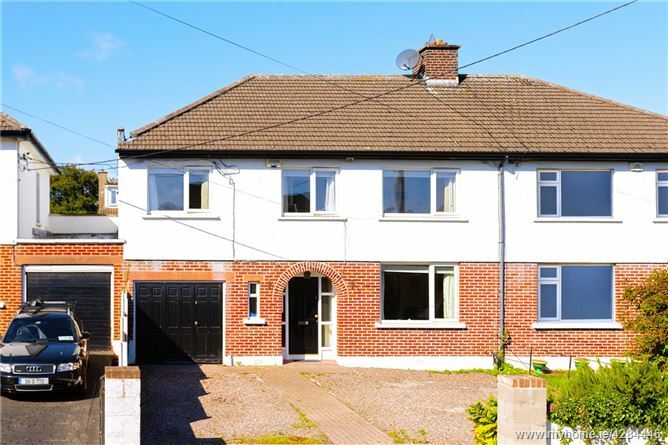 Sherry FitzGerald are delighted to bring to the market 37 Landscape Park a superb semi-detached residence with sunny west facing garden in this ultra-convenient location within one of South Dublin's most popular areas. Built in the 1950's, the property offers the discerning purchaser 1,605 sq.ft approx. (with additional attic room of 180 sq.ft) of generous living accommodation. This home is ideal for family living, having been modernised in recent times and extended over the garage with the framework in place for further expansion should the discerning purchaser require. A welcoming entrance hall flows from front to back to the lovely shaker style kitchen with sunny outlook onto the lawned garden. To the front there is a wonderfully bright sitting room with coal effect fireplace as its centrepiece leading to the dining room and sun room. The ground floor accommodation is completed by a utility room with WC, garage and open space that is suited to further expansion of the ground floor. Upstairs, there are four bedrooms, 1 en-suite and a modern family bathroom with additional converted attic room. The garden of the ever sought after west facing aspect is mainly laid in lawn and benefits from the sun from morning through to late evening. The convenience of this location cannot be overstated within an easy stroll of Churchtown Village which has enjoyed a renaissance over recent years with a terrific choice of shops and eateries. Some of Dublin's best schools are also within easy reach. Public transport facilities are first class with a choice of bus routes to the city, along with the LUAS. The M50 is also within easy reach allowing swift access to the airport and the main road networks. Overall this is a superb family residence within a sought after location, offering easy access to the city centre and surrounding areas. Kitchen 2.58m x 5.16m. With tiled floor, fitted base and eye level units incorporating breakfast bar, tiled splashback, stainless steel sink and drainer. Range cooker with stainless steel chimney style extractor hood, Beko fridge, Bosch dishwasher. Larder cupboard. Window overlooking garden and Velux roof window, door to side passage leading to utility. Bedroom 1 5.32m x 3.67m. Generous double bedroom with fitted mirrored sliding wardrobes, fitted drawers, 2 x windows overlooking front garden. Bathroom 2.60m x 1.67m. Part tiled walls and tiled floor, white ceramic suite, incorporating WC, WHB, fitted mirrored vanity cupboard, bath with power shower over, stainless steel heated towel rail and 2 x frosted windows to rear. Bedroom 4 2.53m x 4.42m. Double with fitted wardrobes and shelved airing cupboard, overlooking rear garden. Attic Room 4.71m x 3.56m. Spacious attic room (approx. 180.8 sq.ft) with, recessed lighting, 2 x Velux windows, and eaves storage.